Specialists John Parisi, left, and Michael Gagliano work on the floor of the New York Stock Exchange, Feb. 5, 2018. U.S. stock prices fluctuated wildly Tuesday after regaining ground following a sharply lower open on the heels of sell-offs earlier in the day in Asia and Europe. The volatility continued unabated one day after the Dow Jones Industrial Average shed the most points in one day in its more than 120-year history. The Dow fell 530 points at the market open and the more broad-based Standard & Poors 500 Index (S&P 500) tumbled 1.3 percent. The technology heavy Nasdaq Composite Index dropped 1.1 percent. Earlier Tuesday, Asia's benchmark stock indexes collapsed, as Monday's massive sell-offs on Wall Street rolled across the globe. Japan's Nikkei 225 index lost as much seven percent of its value at one point during the trading session, before closing at 21,610 points, a loss of nearly five percent. Hong Kong's Hang Seng index followed suit, dropping just over five percent in its worst trading day since August 2015. The benchmark indexes in Australia and South Korea also suffered serious losses. 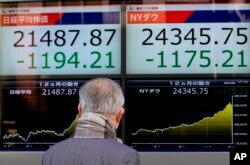 A man looks at an electronic stock indicator of a securities firm in Tokyo, Japan, Feb. 6, 2018. In early Europe trading, London's FTSE 100 was down 3.5 percent at 7,081 points. Asian markets were caught in the ripple effect of Monday's 1,175-point loss on the Dow, marking the biggest point decline in history. The S&P 500 also had a bad day, losing just over four percent to finish at 2,648 points. The stock market has now lost about a trillion dollars in value since Friday, when the Dow lost 666 points. That drop followed a solid jobs report that showed the U.S. economy adding 200,000 jobs and wages rising at the fastest pace in a decade. The tighter labor market and rising wages prompted investor fears of higher inflation and the possibility that the U.S. Federal Reserve would raise interest rates faster and higher than they have in recent years. Analysts who previously spoke with VOA had been expecting a stock market "correction," a decline of at least 10 percent from the most recent record highs, as a result of the record run-up in stock prices this year. In an interview with VOA, Equity Capital Markets Chief Investment Officer Altan Ergun said while he does not rule out a correction, the recent sharp decline in stock prices was probably excessive. "When the sell-off started, it's our belief that the sell-off gets exaggerated to the down side, and that was one of the reasons, in my view, why we had such a sharp sell-off." Egrun predicted sharp swings on stock prices would "continue in the very short term" until investors realize "the global economy is very healthy and growing." He urged investors not to fret about lower stock prices because there will be "great buying opportunities" in "high quality stocks" in the foreseeable future.